OK - the title of this post might be a bit misleading because I haven't had any gluten-free crepes in Alpharetta or North Fulton County. There was a place over in Cobb that had the best gluten-free crepes I've had in the area, but it's now closed. When a friend told me about Au Pan Crepe, and invited me to have lunch there, I was excited. Since I was headed to FL to visit family, a few days after returning to town, we hit up this cute crepe cafe for a late lunch. The really cool thing about the place is that ALL the savory crepes are made with a buckwheat flour mixture - and therefore the crepes themselves are gluten-free. 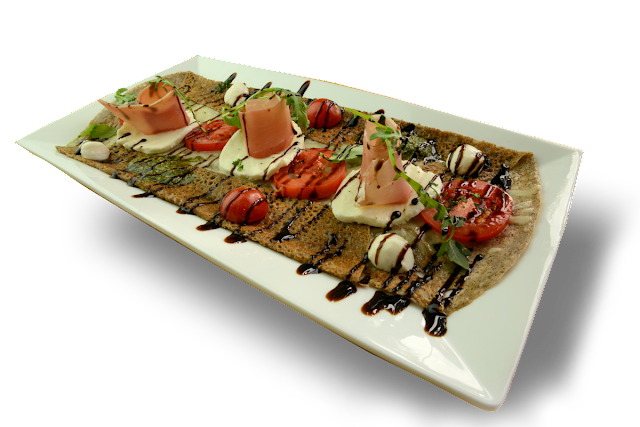 The sweet crepes are made with wheat flour so if you want a sweet treat, you have to order it be made with the gluten-free flour. The first buckwheat crepes I ever had were a quite tough and the second version was extremely delicious. I had each of those crepes in Montreal. Therefore, I realize you can find a tasty crepe made from buckwheat flour and you can find one that reminds you of shoe leather. Thankfully, the version served at Au Pan Crepe are really good and they reheat really well! I had a basic ham and cheese crepe and it was served with a salad (or soup which was also gluten-free). It was so large that I took half of it home to enjoy the following day. Now that I know the crepes are this place are so good, I will definitely go back to try a sweet version - made with the savory batter, of course. I think they will also be tasty and I'm looking forward to reporting back on those in the near future! UPDATE: We tried the sweet crepes which must be ordered gluten-free (otherwise, the are made with wheat flour). The Crepes Suzette with fresh whipped cream was absolutely wonderful! Will definitely be back for more sweet and savory crepes at this darling place! The one fast food chain I frequented (at least, when traveling) before my celiac dx was Chick-Fil-A. Loved the fried chicken sandwich....simply loved it! So when I had to start ordering grilled chicken tenders when making a pit stop on the way to FL, it was disappointing. The tenders were good enough, and the fries (made in dedicated fryer) were yummy so it was fine. Eventually, someone made an unfortunate decision to change the grilled tenders by putting them in some horrible marinade. It is so bad, in fact, that I thought I got a bad batch...thought I was going to get sick after eating one nasty tasting tender. It didn't occur to me that the product was supposed to taste that way...seriously, it was gross! The second time I ordered the tenders (after the unfortunate experience) I realized the tenders must have been changed (for the worse!) and I confirmed this with the restaurant. Thus began my quest to find suitable quick, safe food when traveling. No more Chick-Fil-A for me since all I could get was the grilled chicken sandwich, sans the bun, and that didn't seem fair since I was paying for a sandwich. I can be cheap in the most silly ways...lol! Fast forward a few years (to 2017) when Chick-Fil-A introduces a gluten-free bun! I was so excited by this development that I realized I was going to have to try it before taking a trip that would lead me there for a pit stop. After reading reviews of the bun, I braced myself for the bread to have a sweet flavor - something I'm not looking for a in bun unless cinnamon and sugar are involved. 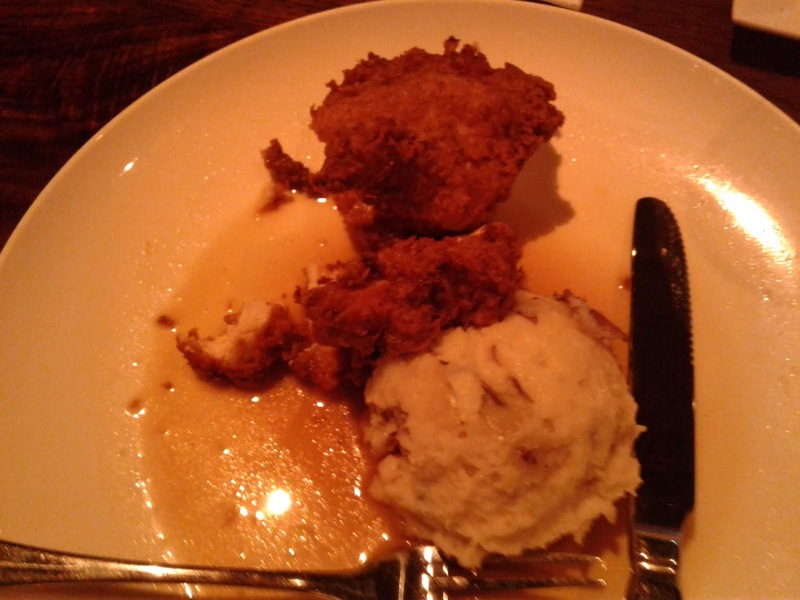 UPDATE: The Bantam+Biddy at Avalon closed several weeks ago (as did the location at Lenox). The original location at Ansley Mall is still open and the location in Chattanooga should be open soon! It's hard to believe that it's been 12 years since I started following the gluten-free diet due to my celiac diagnosis. Within that first year (2006), three in my family, including me, were gluten-free so at least holidays with them have been a breeze. Back then we didn't have all the wonderful things now available at your local grocery store - or at Whole Foods, Sprouts and Earthfare. 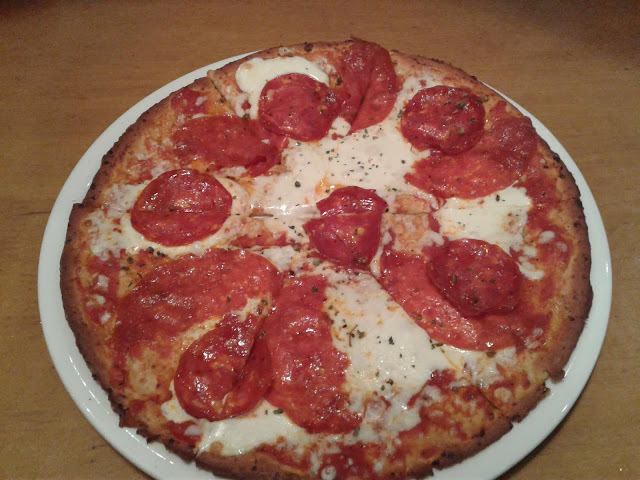 My first pizza crust, pasta, cookies and cake mix experiments had me thinking I would not be enjoying any of those things ever again! Talk about gross....no wonder people generally think all gluten-free food is horrid. For many years, much of it was exactly that. I remember reading a grocery report that stated by the end of 2010, gluten-free items would disappear from store shelves and the gluten-free craze would be over. Isn't that a hoot? That particular paper was partially funded by the wheat industry, by the way. 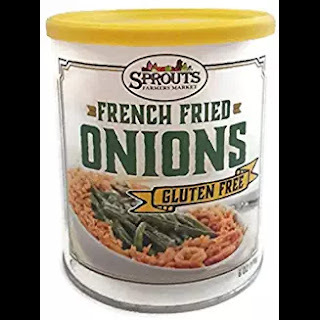 Almost a decade later, the gluten-free label has been slapped on the most ridiculous things like canned pineapple, coconut milk and sea salt. And there are more cookies, crackers, cake mixes and pasta brands than the gluten-free market should be able to support. Yet, almost weekly I come across something new...it's a bit overwhelming even to me. From talking to people who are gluten-free for various health reasons, which are not related to a celiac or gluten intolerance diagnosis, it seems that the gluten-free market is going to continue to thrive much longer than anyone anticipated. All indications are that there will likely be people that continue to order gluten-free buns, etc. just for the heck of it - who would not know if they ate food containing gluten. That's really not a problem unless you can't get a bun because one of those people took the last one. The biggest concern I have (the same one as hoards of gluten-free folks) is that eventually many trend diet followers will fall off the gluten-free bandwagon, so to speak. When that happens, some of the larger food companies will discontinue some items on their gluten-free roster. Business is business and if they didn't do that, it would not make sense. What we'll be left with in terms of product selection, quality ingredients and of course, wonderful taste are the unknowns in that scenario. 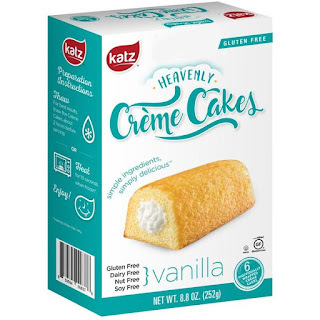 Let's hope there are enough great tasting, quality replacement foods left after the gluten-free frenzy dust settles down. Obviously, most steakhouses are fairly gluten-free friendly. Sauces and some side dishes might contain gluten, etc., but it's relatively simple to get a safe gluten-free meal at a steakhouse - if you order steak and baked potato, for instance. However, I'm not a huge fan of steak anymore, and neither is my husband so we rarely eat at steakhouses. Enter Pampas Steakhouse in Johns Creek, GA. One of my gluten-free friends told me about this place as she went with in-laws for a birthday celebration. After hearing about the Truffled Potatoes Au Gratin - yes they're gluten-free(!) - I went about planning a b-day celebration of my own - or rather, for my husband - at Pampas. 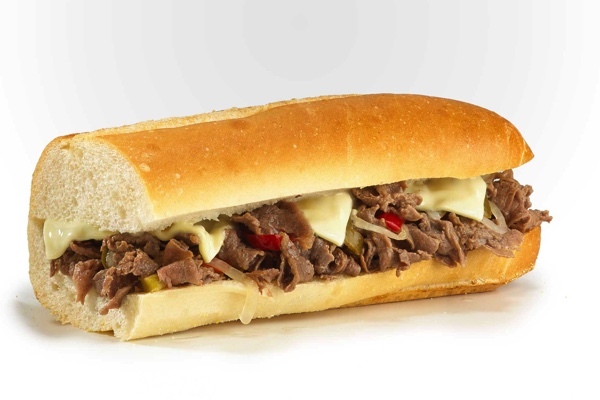 The online menu denotes which items are gluten-free, except for in the dessert section. Thankfully, the sweet treat we wanted, bananas foster, is indeed gluten-free. Several other options are as well. 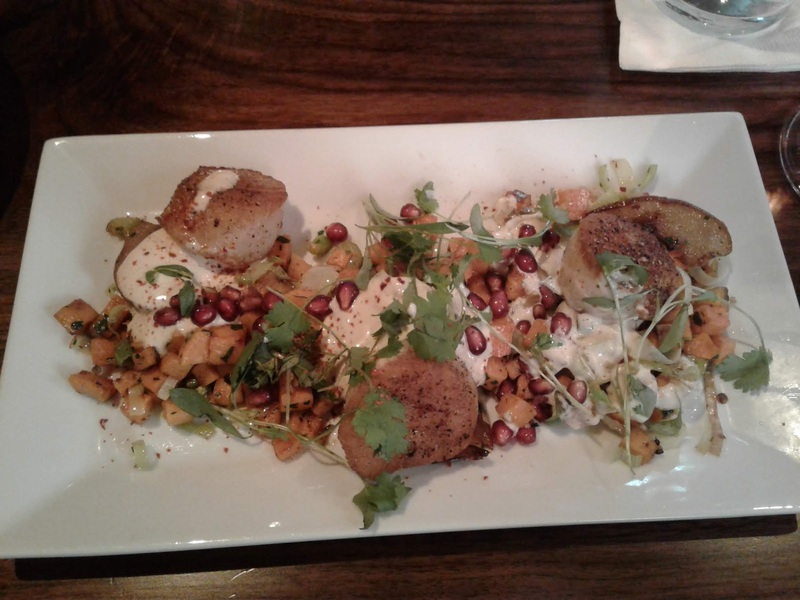 With most of the meats and several seafood dishes being gluten-free as prepared, the Chef at Pampas is happy to accommodate other requests, when possible. Therefore, I inquired about having a crab cake appetizer and, to my delight, was told that was doable! The atmosphere at Pampas is quite lovely with warm, inviting decor. We sat in a comfortable booth and our well informed server knew it was my husband's birthday (noted on reservation) and that I was getting a gluten-free crab cake. We ordered salad and the (non gf) lobster bisque as starters. My husband enjoyed the bisque and we both enjoyed the salad. However, the star of the show for me was the amazing almost all crab meat crab cake. The presentation was lovely and the taste was even better! As there was no breading, or filler of any kind besides minced veggies, it was a refreshingly light crab cake. I've had similar crab cakes before, but this was the best version without breading that I've had out in over a decade! My husband said his Center Cut Filet, with au poivre sauce, was wonderful and we were both impressed with the side dishes we chose. Those are meant to be shared and even then, we took some of each one home! The basil fried corn seemed very fresh, as if it had just been shucked off the cob, and was delicious. The Truffled Au Gratin Potatoes were the main reason I wanted to go to Pampas and were more dreamy than I could have imagined! The only issue I have with it is that when I make my own version of the dish at home, it will never compare to the amazing option at Pampas! The icing on the cake, so to speak, during our amazing meal didn't involve cake at all. We ordered a dish my husband makes a wonderful version of - meaning we're super picky about it - Bananas Foster. Once again, this dish, which is prepared table side as it always should be, didn't disappoint. Like most versions of this decadent treat, eating just half the generous portion will put you in a sugar coma, but it was well worth it! I actually had a quarter of it (they nicely split the dish for us) and my husband enjoyed the rest. It's honestly worth going to Pampas Steakhouse for the sides and desserts for me, but for most people, it's about the steak. Aside from my husband's lovely filet, I'm happy to report that friends (who've had other steaks there) have been quite impressed with the quality of meats offered at Pampas! Other notes worth mentioning: valet parking is available and we saw no children during our visit. To my knowledge, there is no rule about kids, but we appreciated the "adult atmosphere" we enjoyed during our fabulous visit to Pampas! For the most part, I've had good luck getting safe, and even tasty, gluten-free meals at office holiday functions. It's still annoying to have to research who you need to speak to re: getting a safe meal, and disheartening to find out you're the only person attending with this request - seriously? Anyway, when the lovely snowstorm hit Atlanta recently, we assumed the holiday party that was set for the same weekend would be cancelled. It was not. After confirming the roads were clear, no black ice that day/night), we decided to attend the party as planned. The person in charge of planning the event at Evergreen Conference Center Stone Mountain knew I needed a gluten-free meal. I was informed ahead of time that I was not to eat anything off the buffet line. Fine with me - no line, no problem! Once we decided we were ready to eat, I informed one of the ballroom staffers that I was ready for my meal. Shortly thereafter, a hot plate of food was delivered to me, as well as a cold salad. The salad was fine, nothing special and the dressing of oil and vinegar uninspired, but it was in fact, gluten-free. The "hot plate" however was very impressive. Three of the buffet entrees were included (salmon, chicken and steak) as well as mashed white and sweet potatoes and roasted winter veggies. Once I finished my meal (or rather gave what I could not finish to my husband), the staff quickly showed up with a velvety slice of flourless chocolate cake. I could only get two bites of it down (I was stuffed already), but it really was quite lovely! Overall, the experience was very positive and we were glad we decided to attend the party in spite of the frigid weather. Well, it wasn't quite as frigid as it's been here of late, but for mid-December, it was quite cold to these Florida born party guests...lol! So, I'm asked gluten-free related questions all the time. The bad part is that there are some questions I can't answer - even when I go to extra trouble to do so. I thought it might be fun to list some of the ones I can answer here, since I get some of the same questions over and over again. We're out to dinner with a party with another celiac. They want to know why Red Robin's gf menu doesn't list bleu cheese as safe. Likely answer - someone on the corporate side read some very old, outdated and untrue info about bleu cheese containing gluten. It was once thought that was the case, but later on, very extensive studies (mostly done in Canada) proved the theory about the mold used as a starter for bleu cheese containing gluten was never accurate. I'm a bleu cheeseaholic, so there. At a very popular place in Ashville, NC (no, not the fabulous Posana Cafe), I'm told I can't have the strawberry salad unless they leave the bleu cheese off. Tom + Chee's nutritional data stated (at last check) that their bleu cheese contains gluten...and so forth and so on. Bleu cheese is the most common thing I've come across as being listed as containing gluten, when there is likely no bleu cheese to be found in any commercially available bleu cheese. At least those found in the U.S and Canada. At one time, there was supposedly some gluten in some movie popcorn ingredients, but these days, that doesn't seem to be the case. Since going to the movies is still one of the best entertainment values out here, I made sure to check on the popcorn safety at the chains I frequent. Both AMC Theatres and Regal Cinemas serve gluten-free popcorn - at least without the fake butter. Since I've not had any interest in eating whatever they call "butter" (it's in no way, shape or form butter, by the way) at movie theatres in over thirty years, I didn't bother to check on the ingredients in it anywhere. Going to the movies is the ONLY place you can go and just walk up to the counter, order popcorn and a soda and enjoy it while watching a movie like everyone else. No zillion questions about ingredients, preparation methods, etc. Just make sure to skip the Twizzlers, which for reasons I'll never understand, do contain gluten! Is mayo (or mustard or ketchup) gluten-free? Until recently, I thought this question was put to bed. And then, of all people, a doctor said to me "you can't even have mayo, right? It has gluten in it"...! I almost fell over, seriously. Thankfully, this doctor has nothing to do with celiac, but still - it's 2018. It's been well over a decade since there's been much confusion on this topic. Let's just say that while I don't like mayo (except in deviled eggs) and I can't even have a ketchup bottle on a table when dining out (it so grosses me and my husband out! ), I might not be here anymore if mustard, or anything with distilled vinegar in it contained gluten. Keep in mind that malt vinegar is almost always made from barley and therefore, it is NOT gluten-free. Why would Twizzlers (lemon curd, cream of mushroom soup or barbeque potato chips) contain gluten?! There is an exclamation point above because that is how people ask those questions. As if I am surely confused or have a serious learning disability and I don't know what does and doesn't contain gluten. That's right - I've been gluten-free for over a decade so how would I know such things....DUH! The answer is that I have no idea why those items can, and often, contain gluten. You'd need to ask the companies that make the products about that. Thankfully, many lemon curds, and at least three brands of cream of mushroom soup (including one condensed), is gluten-free. You can eat most anywhere these days since everyone knows what gluten-free means, right? The answer to that comment-turned-question is simple. No, no and no!!!! Many places with printed gluten-free menus (especially large chains) don't have a clue about how to serve gluten-free customers safely. So, we can't just go out and eat anywhere. And if someone means I can have a plain salad, that just plain insulting. Who wants to go out to eat at a place where the only gluten-free option is a boring salad?! Certainly not me. There are more annoying questions than room to discuss here, and I guess we'll all be dealing with them for years to come...possibly forever. Especially if we live out our days in the USA. Best chicken fingers in the ATL! We've been going to Bantam + Biddy for several years now. Mostly we go to the Avalon location, but when visiting to the HIGH Museum, we like going to the Ansley Mall location for brunch. The owner, Shaun Doty (who also owns Chick-a-Biddy and YEAH! Burger) has been serving up gluten-free specialty items for many years now - most of which are exceptional. Though I'd love to be more adventurous when dining out, I'm more likely to get the same dish at a place once I know I love it, than to risk trying something unknown. Therefore, I almost always (or at least, 95% of the time) order the fried chicken fingers at Bantam + Biddy. The dish comes with two gf sides, plus a gf corn muffin - what's not to love?! thing as delicious gluten-free chicken fingers. Though I'm a faithful B+B customer, I've always thought it was odd that there wasn't anything gf for dessert. Eventually I think they had macaroons (or something like that), but never anything I was interested in. That was until my last visit last week. To my surprise, there were cakes in the front case (Avalon location) marked gluten-free! We were on our way out and our server (who knew three in our party of 6 were gf) didn't offer us dessert. Our friends had already left before we confirmed the cakes were gluten-free so we took a piece of Butter Pecan Cake to go. It was both gluten and dairy free and the frosting was insanely delicious. The cake was fine, but it did seem dairy free - if that makes sense. The frosting didn't seem anything free - I could eat it by the spoonful! I think the other cake they had that night was German Chocolate so I might try that another time. Also, during the visit noted above, the chicken fingers and corn muffin were both better than I ever remember them being. My friend agreed that each item was more moist than in the past which made them even more delicious than you'd imagine. Now the chicken fingers are among the best I've had ever - with or without gluten! Looking forward to trying The Federal, Doty's latest venture, sometime soon! Now all we need in this area is a YEAH! Burger at the Halcyon complex....think about it, Shaun! Remember the movie Love Story? In it, there's a somewhat ridiculous line, though it's sweet in the film, "love means never having to say you're sorry". I told you it was ridiculous.... Anyway, I was thinking recently about what gluten-free really means. Of course, it means different things to different people. There are some, or rather, many of us that are gluten-free because we have celiac, a gluten intolerance issue or worse, a wheat allergy (gluten-free is wheat free, but wheat free doesn't mean gluten-free, BTW). Then there are hoards of other people that couldn't explain what gluten-free actually means for a million bucks. I think we've all been guilty of being glad that so many people have jumped on the gluten-free bandwagon in the last several years. 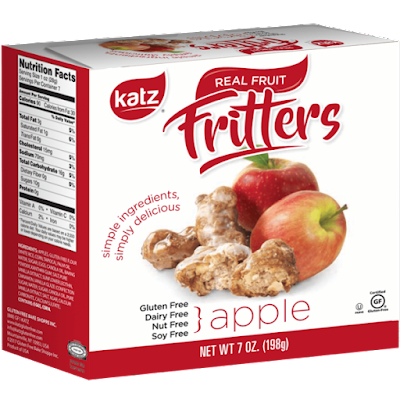 It's hard not to get excited when you can find a gluten-free version of apple fritters, battered fish and even "fried onions" at your local supermarket. 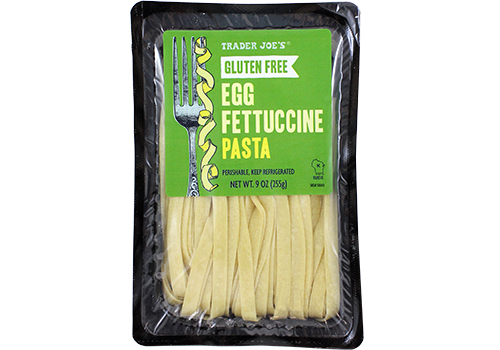 Today in fact, there are more gluten-free versions of things I can have than I can't. Over a decade ago, I never thought I'd be able to say that. Recently, I attended a charity event (which I didn't buy tickets for, but went as a guest) and beforehand I checked to see if any of the "finger food" served at the venue would be gluten-free. Unfortunately, but not surprisingly based on the town I was in, I found out I could eat something from the saute station and nothing else. I didn't realize until we arrived that some cheese grits with spinach dish was the ONLY thing at the saute station. Oh well, that's why I had cheese crackers, almonds and yogurt pretzels in my bag...lol! We were going out to dinner after the event so I just needed something to nibble on while tasting many delicious wines. But my husband, who gets way more annoyed about me not finding safe food at such events than I do, was determined to find something else for me to enjoy. In checking out the mostly gluten-filled buffet station options, he noticed individual servings of what looked like a berries and cream dessert. Surely, he thought, this must be gluten-free. He excitedly told me about what he'd found and decided we should find out if I could enjoy this lovely treat. Mind you, we're in a hotel ballroom so there aren't servers and employees running around just anywhere. We had to wait for a while until we finally found someone to ask. The guy dressed in kitchen garb, including a "chef's jacket", that I decided to ask about the dessert seemed put off by being disturbed. That's fine by me - I just had a quick question that he could answer easily with a "yes, no or I don't know". His answer didn't bring much confidence that the dessert was gluten-free. In the end, he determined that it was. And if I was new to the gluten-free game, I would have made myself very sick away from home - not cool. Trusting my instinct instead of the questionable (and somewhat questionable) answer from the restaurant staffer, I asked my husband to eat the dessert first. If he determined that it tasted like berries and cream (all that was supposedly in it), then I would have gladly tried it myself. But guess what? There were TINY pieces of cake in the dessert! That's right - cake - and it was NOT gluten-free cake, obviously. How ridiculous is that? I honestly had a hard time believing it happened! I felt really badly that I let this incident pretty much ruin the rest of my night. Not because I ate something that made me sick - I was vigilant enough to keep that from happening. Not because I wanted the dessert either. It just infuriates me that so MANY people in the U.S. still DO NOT get what food allergies are or - or know what gluten-free means. Honestly, only third world countries are behind us on this issue. It's completely embarrassing how misinformed (or totally uninformed) the majority of food service workers are in this country.